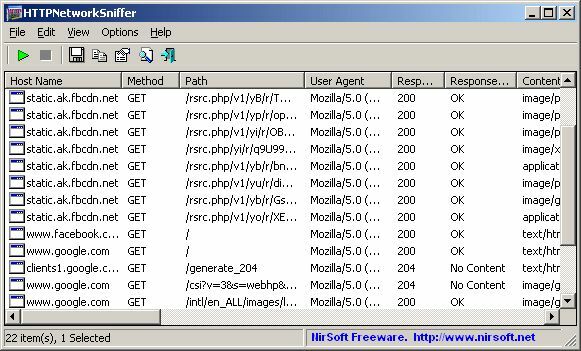 NirSoft HTTPNetworkSniffer is a packet sniffing tool you can use to capture information on all data sent between your web browser and web servers. It shows information on Host Name, HTTP method (GET, POST, HEAD), URL Path, User Agent, Response Code, Response String, Content Type, Referer, Content Encoding, Transfer Encoding, Server Name, Content Length, Cookie String and more in its results. HTTPNetworkSniffer cannot record probe communications through secure HTTPS connections. In order to use HTTPNetworkSniffer, you will need to install a capture drive, such as WinPCap. NOTE: This version is for a 64-bit operating system. You can get a 32-bit version from here.